Following our observations in the previous chapter, we should get used to consider, in all the aspects that make any Ceremonial in every Rite or belief, the presence of the apparent ambivalence of white and black, sacred and profane, as an effect of man's manipulation on the elements that determine, through the desired goals, the pole of quality in its exterior manifestation. This apparent antagonistic duality generated in the mind of non advanced and superstitious men the mistake of believing that in religions as well as in philosophies the non exoteric but metaphysical and super-mundane contents could be achieved and perhaps violated by a mind or a hand guided by a non illuminated will by the Spirit of Light. In actual fact it is said that nothing physical can get in contact with something metaphysical and still keep its exterior and profane attributes, without modifying, making physical and therefore finite, the substance of the object or the essence of the concept that one wished to own. On the other hand if something physical and finite like man's mind can be in contact with a metaphysical and infinite substance or essence, this attribute of man will not remain physical or finite, but by effect of transmutation (called Initiation) it will be modified (create from itself) in likeness of what it tended to and by blending with it, it will be able to understand its essence through his own physical attributes. The resulting effect is called by Gnostics ‘inner sight', whilst mystics call it ‘spiritual sight'. Sacred or holy is not the attribute of the symbol or object or even the idea, but to sanctify or to consecrate is a kind of Work only possible for the Energy of the inner man , who, proceeding through mind and heart makes the Symbol or the Object that his hand holds different from what it was so far: only profane matter. Only the energy that reveals the occult meaning of the Symbol to the physical eye can unveil it to the inner sight of man, now ‘accepted' to the Mysteries. This Energy has many Names, as many as the languages of man, but it is present in every thought that he directs to the One, the Father and Great Architect of the Universe, as His Attribute of manifestation. By autonomously developing these few indications, we can understand how and why an Initiatory level, the Ceremonial and its contents connected to it will not be revealed or violated. The inviolability of the Ceremonial and of Its occult meanings and prerogatives is linked to the real comprehension by the intellect of the man who wants to access it; the flat nothing is the answer to any attempt to penetrate it with the only force of profane reason, whose insistence will lead to a simple imitation without reason or result, the exterior form of what is improperly or prematurely desired. ‘…Freemasonry is the Initiatory System where sometimes some of Its Adept practice Counter-Initiation on themselves and their brothers… '. 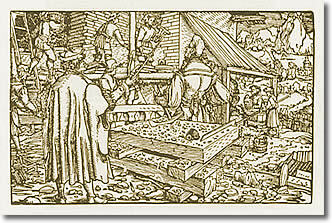 In order to preserve the integrity of Ritual and Ceremonial Mysteries, although in the work of agglutination of the profane band of people, the brothers not yet able to really abandon the cowardice of their own metals will have the faculty to grow in morality and good intentions in the exoteric and Traditional Masonic Trace of recent built, where everything can be experienced without danger of wrong or negative effects for the ‘Destiny' of the Lesser Brothers that operate within it, because it is the symbolic Trunk of a purely virtual initiatory reality and only a reflection of the Truth of the Order depositary of the Knowledge and Ability to Initiate in the Temple. This prerogative belongs to the First Caste of Man. This ceremonial instrument as well has its own language and certain properties, in the exoteric tradition, connected to the psychic and emotional expression of man that we don't want to omit; likewise we think that a researcher cannot neglect a language that is considered as a lesser one, but that could hide rather interesting connections with greater Traditions. The first series of information come from the form of the candle itself; being cylindrical, it is placed on a circular base enclosed in a square. This symbol in sacred geometry indicates the Spirit enclosed in the form by the Matter and the four elements, Earth, Water, Air, Fire, which in our Planetary Logos are represented in the four Kingdoms of Nature in the correspondences with Mineral, Vegetable, Animal, Spiritual and Super-mundane Kingdom. In the man universe, these four elements find manifestation in the correspondence of Physical (or Dense) Body, Ethereal Body (the electrical field or Aura), the lower Mental Body (vehicle of Personality and seat of instinct and desire, the Astral Body) and higher Mental Body (connected to the Triad and seat of synthesis and initiatory Light – the Animic Body of the mystics. In turning from the center to the four cardinal points, the intersections thus created in the body of the candle form an (Astronomical) Cross which, depending on the level of the operator, will be Mobile , Fixed or Cardinal. At the simplest interpretative level, viz. for the Apprentice Brother, that Cross is the symbol of the occult Orientation of the personal (animal) instinct towards what I dare call the animic (spiritual) instinct. But if this is correct in the general concept, in the particular aspect of the many Personalities that form the evolutionary path of every individual man it is necessary to consider it as a correlation of intermediate stages , where the new segment formed by every Personality must be constantly re-aligned to the previous body of experiences now consolidated. Therefore we will have the need for a constant psychological mediation in a work of inner Re-orientation (re-aligning), as the Masonic Plumb Line clearly shows in its esoteric interpretation. In the Orientation of man on the horizontal arm , the panorama offered by comprehension will be developed in the physical and concrete world, because everything is reflected from the plane of the lower or concrete mind. In the Orientation of man towards the vertical arm , we will have, firstly, the affirmation of an abstract and synthetic conception for the use of the higher mental Body. The latter will detach man's needs from the instinctual and finite planes more and more and it will start it to the ability of the metaphysical and infinite conscience (for the concrete mind) through its re-conversion in the intuitive and perceptive planes of male-female, up to the accomplishment of the sphere of availability and mental attitudes where at the center the effect of the Triad can appear, which we call Universal Wisdom. In order to link horizontal and vertical aspects, viz. male and female, in the Universal Cross, we need to reach the center that is unknowable to those who only own ‘half the sky'. From this center the rose of the Rosicrucian blossoms; it is a geometric point only known to the children of the widow because they are Spirits embodied in matter, who, finally aware of their own real Self, re-acquired its Light, in the Initiation on the Path of the return to the House of the Father. The North , towards the top , towards the kingdoms invisible and unknowable until now; the South , towards the bottom , in the kingdoms that we call sub-human; the East , towards the outside , in the environment and the human kingdom; the West , towards the inside , towards divinity itself. By joining the base of the Candle to the Spiritual Top represented by its flame, we will obtain the geometrical representation, invisible to the unaware eye, of a square surmounted by a pyramid, symbol known to any Mason initiated to the lesser Mysteries such as the Quaternary surmounted by the Triad. The geometrical concept represented in the image on the left will be certainly recognizable by the Mason brother, in the future, as the symbolic base for the composition of Rosettes and symbolic decorations on the floors of the Temples in the nave of cathedrals. 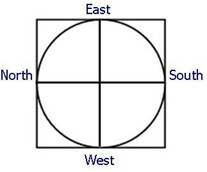 The same meaning must be attributed to the ideogram that is at the basis of the Eight Rays (or points) Star . The esoteric schools of the Lesser Mysteries have always given the Candle a three-fold meaning (excluding the Candle made of vulgar animal fat or tallow). The wax cylinder is considered as the manifestation of the physical Body and the wick that crosses it vertically is the conscience through which the Spiritual Principle represented by the Flame can burn, manifesting itself in the concrete world. In the Maya pyramids we find the same principles if we consider the golden top of 6m on a side by 10m height, which priests ritually placed in the temples of the astronomical conjunctions favorable to their Ceremonials, representing the Will of conjunction between the Physical and the Divine World. We will now continue considering another formal aspect of Candles in the use of ritual Colors. In this case as well we will discover how those exterior meanings hide others, which are more real and important. In order to distinguish the Ceremonial use from the ordinary use of the candle straight away, and then up to its superstitious and profane use, we must remember that in the white candle we usually identify the Spiritual meaning, whilst in the colored ones we find the Devotional (positive) or Astral (negative) desire of the exoteric thought of the man not introduced to the Temple. One unique color for all the candles brings out a unique strong proposition of the operator or the officiant to connect to the characteristic or the quality of a particular Logos or the first step in the search for a lesser alliance with It . From every exoteric form it is possible to go back to the esoteric counterpart, because every exterior manifestation, in order to be alive, must contain an inner reality that reaches through Principles the Archetype from which it originated. The presence of colors on the candles used in exoteric ceremonials or aiming at personal and superstitious purposes, whose separation from the Path of the Left Hand could be almost void, is the vulgarization of the meanings of an initiatory reality that goes back to the Archaic Tradition received at the origin of the Arian race. By talking to the profane world, the Apprentice will find a multitude of interpretations of this topic; he will have the chance to find a common denominator in the emotional and often irrational meanings, as always are the results of desire, fear and superstition of minds lacking the intellect. The vulgarization of a Principle or a Rule, though, are not an obstacle for the young researcher who, if he is educated properly, will be able to recognize the traces of truth in any profane interpretation and in any argument, even the most obscure one. Therefore he will always be able to go back, through segments of concepts, to the Mother Thought; its matrix is where all Archetypes drew their first Form or Guise of manifestation. It immediately appears clear how those emotions and passion that are represented in those colors, in actual fact are nothing but the effect of certain energies at their impact with the Astral Body for the man who there has focused his conscience and the interaction with those emotional effects, with his concrete mental Body. 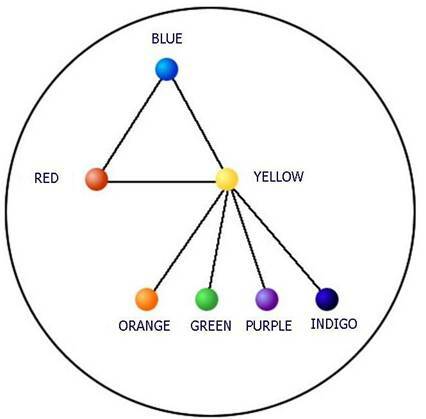 The Three main colors and the Four colors of attribute shown in the previous image are the Seven-fold visible manifestation, in the Hierarchy of Seven Cosmic Energies, that embody Seven Fundamental Sounds of Seven Great Entities, which Hebrew Scriptures call ELOHIM. This new topic, as well as that aimed at penetrating the Starry Vault surmounting the Temple , which we will discuss later, are two windows that open on the world of knowledge higher and wider for the Initiate, Esoteric Astronomy. This, the highest and ultimate Liberal Art among those hidden in the geometry of the Masonic Apron, initiate the Mason to the world of knowledge that, observed through the esoteric eye of the researcher (of Truth) will go from the physical characteristics to the energetic qualities of the celestial bodies, getting used to consider those bodies and those lives at the same level as the consideration that he has found out he can make on himself, learning to conceive the hidden reality of Astronomy. The latter unveils because it includes them, the mystery of Sound and Color; the Harmony of the Spheres which Pythagoras talked about. Here we will discover the bridge between the inner and separated human microcosm and the macrocosm where everything is included, which caused Hermes Trismegistus to declare: ‘it is true, most true that which is above is like that which is below. The most complex, complete and perhaps important instrument in the Oblong Masonic Temple is the Luminary known with its traditional name of Menorah. Before introducing the subject, I would like to ask those Brothers still free from bad habits, not to consider the Menorah as a seven-armed candelabrum . Although it externally appears with such shape and it holds seven candles, we will see, by comparing the real meanings represented by it, that its presence at the center of the Temple as a candelabrum has such a marginal importance that it is irrelevant. Even if we want to emphasize its meaning in that function, the use of this term is indeed poor and demeaning to the ears of initiates. 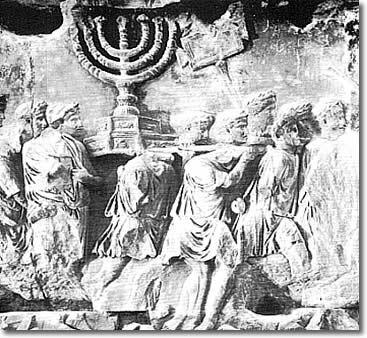 The Menorah is therefore the Luminary around which the main symbolic aspects and the most esoteric meanings of the Masonic Temple revolve. For this reason this 5 th book will be the core of this work at this level. Tradition recognizes two types of Luminaries. The nine-armed Chanukah, where the first arm is mobile; it has superior esoteric contents. The seven-armed Menorah , known at least in the formal aspect, in the world outside the Temple , more commonly used and with more limited meanings than the previous one. For our research connected to the Masonic Temple we will focus our attention on the Menorah, but I would like to leave an indication for the future researcher. In the sacred Chanukah is represented the ninth level of manifestation called Clothesless and therefore of the presence itself of the Will of God . First Energetic Aspect of the Universe. Let's now consider some of the symbolic aspects of this Luminary among the closer to the Masonic Ritual needs and its interactions inside its Temple . The Menorah in the biblical interpretation contains the representation of the seven days, six + one ( the seven Eons ) of Creation. Going down in the interpretative need, at the level below we will recognize the representation of our Solar System with the exoteric manifestation of the Seven Sacred Planets or Logoi (the Seven Thrones in front of God) of the Twelve known by the Initiatory Tradition. For others, as we will see later, the hermetic term of Hidden Planets is used. The three-fold octagonal bases on which the Luminary rests must be considered by the researcher and Mason the Fundament of the Work of manifestation in the descent of the Will of the Great Architect, from the Top to the Bottom . From the World of Spirit through the World of Thought up to reaching the World of Form and manifest it. And in the accomplishment of the Work of Man on the Path of Return, from the Bottom towards the Top . From the World of Form ( Personality and Its attributes) to the World of the Mind ( the Triad and Its attributes ) up to the World of Spirit ( the Monad and Its attributes ) going back to the House of the Father its Creator. The form of the three bases, as we have already said, is octagonal ; to explain it we will consider only two meanings because they are the only ones strictly related to the Temple of the Freemasons. Eight because the double square, the white one and the black one, mark the presence of the human duality creator of the World of Chaos in the opposite of the profane, later become complementary in the Initiate for the positive-negative of spirit-matter as the Mosaic law (Morale) of good and evil presents it. We find the representation of the same concept of opposites in the floor of the Masonic oblong, which indeed symbolizes the Personality of man, where this duality is manifested through the conscience element. Highlighting such thought, the seven arms of the Menorah represent in the man-matter the negative where he includes the Seven Planetary Forces in the expression of the seven capital vices, whilst at their opposite positive, the Seven Magisterial Virtues that we know in the moral proposition of: Justice, Charity, Strength, Prudence, Temperance, Hope, and Faith. Eight because the Menorah is the representation of our Solar System which, expression of the quality of the Aspect of the Energetic Synthesis that produces it by Will of the Great Architect of the Universe (1) is reflected in Seven Energies that with as many characteristics and qualities interact in the 5 Kingdoms of Nature enclosed in the symbol of the Pentalpha and, as far as we are concerned in this work, especially on man, through the Seven sacred Planets. Each of the seven rooms of the Great Pyramid was known with the name of a sacred Planet. The sacred Planets are represented in the Temple, from the idealization of the Perfect Masters for the Masons that make the hierarchy of the Lodge. As the Tradition of the Order says, Seven Masons are necessary for the constitution of a True Lodge, Nine Masters for the Constitution of a Perfect Lodge. Therefore once again we have, in the separation of the Work in three levels and as a consequence a separation of the Order in the whole, the number 7 for the accomplishment of the esoteric plane linked to the Royal Art, and the number 9 for the accomplishment of the Initiatory plane linked to the Sacerdotal Art or Ars Pontificia . They hide the sacred mystery in the ancient times of the number 12, Synthesis of the Royal Secret in the 32 nd Degree of the Scottish Rite . As a consequence of what we have said, the Masonic ceremonial orthodoxy imposes that only in the degree of Master the seven lights that illuminate the Temple are lit , because only then the end of the creative Work and the start of the Work for the benefit of the Humankind are symbolized. All Freemasons know the concept of hidden triplicity of any Form in manifestation. First and second, the concrete Form with the energetic field connected to it and third, the energetic Aspect interacting with them but free from them, called by Mystics Spiritual Body. This three-fold principle recognized by us in Man must be applied to all the Forms and also the Stars that live in the Starry Vault. As for man, where in the Form visible to the physical eye is the concept of separation, whilst in the energetic and spiritual Forms, invisible to it, is the concept of inclusion with the whole or, to use a more common term, universality, for Planets as well the concrete part gives the illusion of separation ‘from the rest' whilst, through the other two aspects there is a constant relation of Connection ‘with the rest of the Universe'. This Connection occurs through the Motion of Manifestation; this in short is ‘the secret' of the hidden or occult Planets. A Planet that is more energetic because it is more advanced, allow me an allegory, being the ‘Tutor' (for the Law of Magnetic Resonance) of another one that is weaker because it is in the process of evolution and growth, like for the law of communicating vessels, interacts with the outside through It, precipitating in Its aura part of its force in energetic characteristics and qualities. I think that this simple explanation is sufficient to the Brother to continue in our topic without invading the field of Occult Astronomy. Therefore the Planets not yet consecrated are Earth, Mars, Pluto (connected to Vulcan) and the Moon, which hides the ethereal presence of another Planet now disappeared. If we referred back to what we said before on the energetic interaction between Man microcosm and energetic macrocosm of the Systemic Universe, with the exclusion of the concrete or heavy Forms of the physical Bodies, we would have an idea, although small, of a knowledge that has not been exteriorized in the commonly esoteric world, yet. Esoteric Astrology is the Science of the Soul, which Initiates use to harmoniously tend Their Plumb Line between Triad and Personality and therefore to originate the Occult Sound that inflames the Space around Them with the use of the Thought. With an allegory, the catechism of Tibetan Lamas call the thought able to project itself ‘the initiatory arch'; they shoot their arrows in the World of Forms in Words, Sounds and Images. These are the prerogatives of the Initiate.